Ahh, the one question that everyone wants the answer to — how much do I charge for a sponsored post? We have talked about how to best negotiate your rates, but in order to really gauge your payment, you need a good baseline to start. How much you should charge really has 0 to do with a number, and everything to do with understanding the different factors that come in to play when garnering that "perfect number" — the size of the project, the requirements, the company/brand budget, the deadline, etc. That being said, it’s good to have a base price in mind to give to brands when it’s time to start talking payment. Sometimes brands will tell you what they’re offering upfront. I always like this because it lets you avoid the annoying back and forth and shows you that the brand really means business, as they have set aside money in their marketing budget for sponsorships. I want to go over the groundwork before we crunch the numbers, so you can start to think and feel for yourself when it comes to knowing your value, and monetizing it. Here are my no fail guidelines to guarantee that you charge a rate that is fair and lays the groundwork for financial success an an influencer. Before we dive in, I want to make sure that you understand that your work matters, and should be compensated for it. And I am not talking in the form of product or gifting. I am talking an actual pay check. You wouldn’t start a new job at a restaurant and accept payment in the form of mac and cheese or the occasional Caesar salad, would you? You deserve to be paid just like everyone else in this country who has a job, so why is it ok for brands to ask you to promote their stuff in exchange for product? Bottom line, its not. You’ve put effort into your web design, photography, social media growth and developing yourself as a brand. There is so much time spent and value offered. This is something you built. If you have knowledge, a skill set and you work, you get paid. That’s simply how the world works and blogging is not different - it's just as much a job as being a server at a restaurant or an accountant at an office – the only difference is the set of tools you use. It doesn’t do anyone good to accept work in exchange for free product. And if you want me to be completely honest with you --it diminishes the quality and growth of influencer marketing and the business of blogging as a whole. What this does is tell the people reaching out to you that it's acceptable to not assign value to your work and to feel free to approach other bloggers in the same manner. This is what I call “Blogger Devaluing” and all it does is reduce the worth of the work we do as bloggers. The rule of thumb is simple, : always charge something for your work, even if the product itself is free. If you are doing this -- then I encourage you, for the sake of your job, for the sake of my job, and for the sake of every other blogger who is reading this posts' job --- please stop. It all started with each of us, we can't be the source of the problem by accepting offers that diminish our growth. You are worth more than a gifted necklace or dress. I promise. I appreciate your interest in (X BLOG). I have worked for the past +X years to build my brand, audience and reach. Paid placement is a reasonable request to have access to my dedicated and highly engaged audience, as well as my compensation for the time, photography and equipment it takes to run my blog. I only promote products that I have fully tested and truly endorse. Feel free to reach out in the future if you budget changes, but please be aware that we are running a business and cannot provide free work. Are you looking to build a niche category of sponsored work? Then it might be ia good idea to take on 2-3 product posts that you are (truly) interested in and build a quality showcase of your work. This is what I did a lot in my first year of blogging. It’s hard for a brand to understand the quality of work that they will receive if you don’t have any current examples of this. I know it’s tempting to not do a really spectacular job when it’s for free, but think of it as padding your resume. Once you have excellent, well written, quality product reviews/sponsored posts live on your website, you are good to start charging fees from then on, without ever looking back! There are, of course, circumstances when gifting or exchange is acceptable. Someone offers you a complete home makeover for a blog post, a trip of a lifetime, or the value of the product far exceeds the value of the post. But, the likelihood of this happening is fewer and far between. It’s usually a product with little worth and most times we couldn’t even use it. One time, I accepted a sponsored post in exchange for a collection of furniture that exceeded over six-figures. Therefore, I was more than happy to write about the furniture "for free" as the value I was receiving was very high. Also, it gave me an opportunity to build a relationship with a brand that I really loved, and I still work with them to this day. So its important to note that if you get a really great opportunity to work with a brand that you truly love, then I would consider the opportunity based on your long term goals. I really want to emphasize that as soon as you start charging for posts, not only do you value your work, but you’ve sent it out there into the blogger universe to come back to you ten-fold. One of my Pitch It Perfect students recently shared that when she put her foot down with herself and set her values (quite high) the offers she receives are high quality and have led to her being able to run her blog as her full-time job!! Rule 2: NEVER, EVER include a rate sheet. EVER! Did I make sure to mention to never, ever, ever, do this? :) You never want to send a rate sheet. If you have your rates listed somewhere on your site, please take them down when you pop off of my site later! The reason is simple: you lose all of your negotiation power. Rate sheets are usually just a way for brands to find the cheapest rate and do a quick shop comparison in most cases. It doesn't do you any good and the only purpose they serve is to set false expectations. Rate sheets are also getting very archaic, as the in the know and well versed brands and PR firms have come to realize that there are far too many things to take into consideration when partnering with you for work through your blog and socials. Depending on what factors come into effect, what you charge one customer/brand may be completely different from what you charge the next. You want to consider things like, lead time (the time it will take for you to complete their requests), cost of production (photography/videography etc. ), social sharing specifics, exclusivities, and your blog and social reach. If you have a media kit, it’s a great place to include an outline of what’s included in a sponsored post and the pricing, but never actually include the price! You will also want to create and have both parties sign a contract, this way you are protected. There is nothing worse then talking with a brand about a post, do the entire thing and post it and find that when it’s time for you to get paid, they’re suddenly non-responsive. Signing a contract helps avoid these issues and also holds each party accountable for their responsibilities. Never ignore an email because every contact is an opportunity to monetize. Just because a customer doesn’t know your value does not mean you can’t educate them. Some of my best opportunities has come from replying to emails that I didn’t think would lead anywhere (yeah...you know those emails I am talking about). No one will fully understand the value of your work until you toot your own horn and tell them. Even if the brand is reaching out to offer you a product in exchange for a post, you still have an open window to try and gauge what kind of budget they could be working with to try and meet them in the middle. One question I always get is: "What if a brand won't give you a budget and keeps asking for yours?" 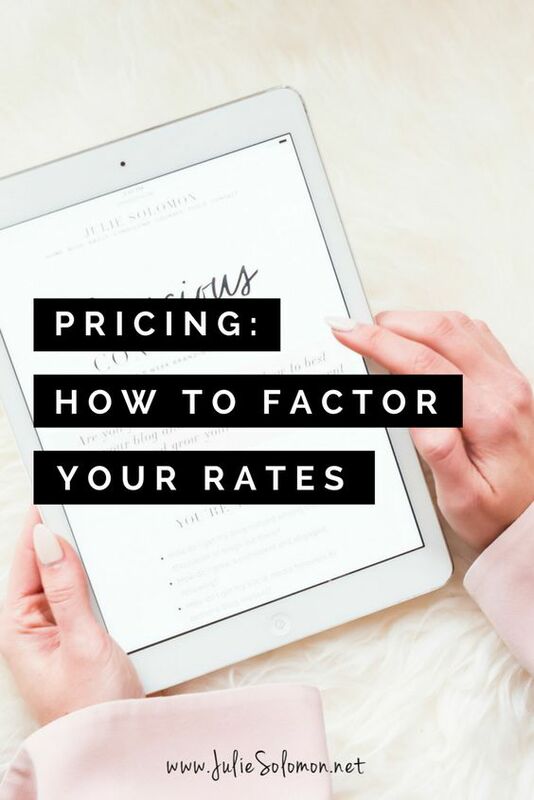 If you want to know how to respond when a brand demands a rate, but you don't want to give them specifics, then head over to Pitch It Perfect - where I lay out exactly what to say, and give you email templates for you to respond when quotes are requested. I’ve listed these guidelines to help set the standard for any blogger or influencer work. I have also included a rate sheet calculator worksheet, for free, that will help you factor your rate! Download it below! Remember, this is for internal use only, so you can gauge a starting price point for all your amazing work. If you are serious about stepping up your blogging game and want to know how to factor the range of rates you need, how to best negotiate, and how to respond to brands with confidence, then I encourage you to sign up for Pitch It Perfect and get your 10% off today! Too often we see people being taken advantage of by companies offering minimal payment (or no payment at all) for maximum work. It was time that I share the wealth of information so you too can grow and shine your amazing work on to all of us!! The more we all stick together, the easier it is for all of us! How do you navigate charging for posts? How do you factor your rates? What have you found that works well, and what have you found that doesn't? Any advice to share with us? Please leave your comments and thoughts below by clicking the "comment" button at the bottom left.